Coming off arguably their finest effort to date with the kung-fu/blaxploitation adventure "East Meets Watts," Cinematic Titanic returns with a second helping of their burgeoning live act in "The Alien Factor." Another lackadaisical statement of unfiltered goofballery from the 1970s, the newest target of riff rage proves to be a worthy contender to the franchise crown, with the gang shaping 80 minutes of uninterrupted hilarity, feeding off the frisky stage energy to give this sorry routine of rubber suits, cruddy acting, and endless strolls a needed kick in the behind. 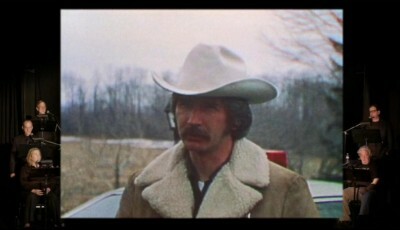 B-movie cult figure Don Dohler directs "The Alien Factor," a 1978 cheapie that pits rural Baltimore against a series of invading, claw-happy aliens, who've arrived to raise some hell in perhaps the bleakest place on Earth. On one side there are towering, gnarly extraterrestrials that stalk (or perhaps cautiously limp) through the night on the hunt for prey. On the other side is a community made up of inattentive cops, an ineffectual mayor, an easily impressed newspaper reporter, and an alien hunter of some sort, who knows how to bring intergalactic vermin to their space knees. It's a war of palpable inertia, leaving the true battle scars raked across the patience of the viewer, forced to endure Dohler's NyQuil-stained sense of drowsy screen energy. Mercifully, there's help in the form of Cinematic Titanic (Frank Conniff, J. Elvis Weinstein, Mary Jo Pehl, Joel Hodgson, and Trace Beaulieu), who come to this DVD with batteries fully charged, eager to shred the sustained ineptitude of "The Alien Factor" apart. This is their second live effort, and while I was initially skeptical about the switch from silhouetted studio sorcery to cocktail-hour stage efforts, I must admit, the in-the-moment comedic opportunity suits the team superbly. While the new DVD doesn't quite top the peaks of eye-watering hilarity that defined the "East Meets Watts" viewing experience, it comes damn close, due in great part to the celebratory live atmosphere, where the entire troupe is observed relishing every last slap delivered across the face of this dreadful picture. Cracking wise in front of an audience permits Cinematic Titanic an instantaneous response, which plays well into minor bouts of improvisation, endearing mistakes, and authentic outbursts of laughter. While carefully prepared, the gang brings a sense of joy and spontaneity to the proceedings, which always helps to encourage the giggles beyond mere recognition of obscure references and general one-liner silliness. The crowd assembled here seems genuinely bewildered by Dohler's picture, guffawing through the presentation, reassuring those at home that this is indeed one bizarre motion picture. Their enthused reaction is contagious. "The Alien Factor" is a no-budget sci-fi staring contest of sorts that Dohler never slams out of first gear, even while armed with some tempting genre accouterments. Every last one of them cheeseball, but admirable (including a late-inning stop-motion animation fight between the alien hunter and his prey). The riffs tend to latch onto the picture's absurd effort to pad the running time with extended takes of woodsy sleuthing ("What could be more cinematic than a mildly strenuous walk? "), which seems to pass for suspense in Dohler's mind. The amateur acting also receives a much deserved spanking by the jolly hit squad, who gleefully underlines the cast's substandard attempts to enliven the one-dimensional Watersesque staging. Technical foul-ups and editorial apathy endlessly please Cinematic Titanic as well. However, the best riff material is reserved for the decidedly period appearance of the cast, which brings out a triumphant run of music world references that had me laughing to a point of potential medical attention. 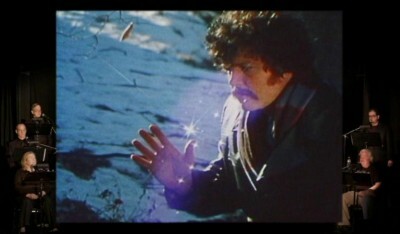 Reminders of Three Dog Night, Mac Davis, Tom Petty, Joe Cocker, Boston, Edgar Winter, and Slade push "The Alien Factor" DVD into a classic rock celebration of sorts, further encouraged by the film's mid-movie discount barroom musical number. It's truly side-splitting material. 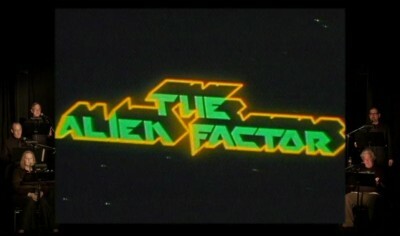 Something for family audiences to keep in mind: "The Alien Factor" riffing includes some mild cursing. Consider the DVD more of a PG-rated experience. 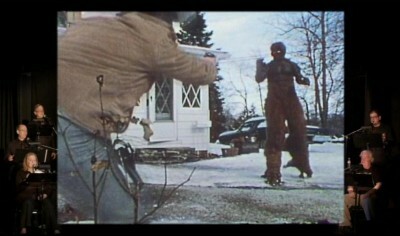 Presented in anamorphic widescreen (1.85:1 aspect ratio), the "Alien Factor" DVD presentation makes marvelous use of the frame, leaving the option open to ignore the faces delivering the jokes by simply fixating on the film itself. On larger displays, the action digs up a few moments of pixelation, but for the most part, the program seems stable and in line with the rest of the Cinematic Titanic releases. The Dolby Digital 2.0 sound mix preserves the straightforward audio experience, holding the audience laugh track to a less intrusive level of interaction, while the professionals go about their laugh business. All jokes and improvisational muttering is clearly audible. An extended Trailer for the previous DVD, "East Meets Watts," is included. The more stagnant "Alien Factor" grows, the more Cinematic Titanic lunges for insanity, hoping to combat Dohler's leaden touch with round after round of sparkling verbal gunfire, resulting in a steady run of bellylaughs. I'm completely sold on these live efforts, with "East Meets Watts" and now "The Alien Factor" showcasing the pure wit and good-natured monkey business Cinematic Titanic is more than capable of delivering, best supported with pronounced facial reactions in front of an energized crowd.